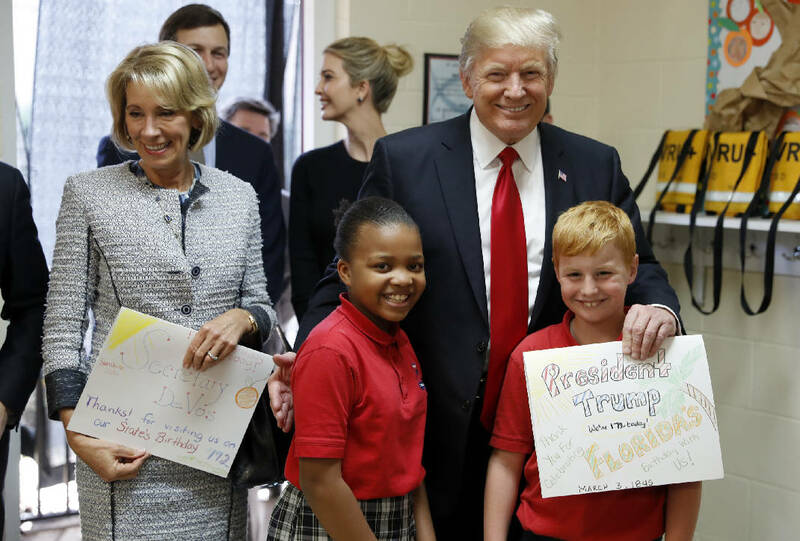 WASHINGTON — President Donald Trump toured a private religious school in Florida on Friday, praising it as an ideal institution for "disadvantaged children" while re-emphasizing that his education agenda will focus on school choice. Trump visited St. Andrew Catholic School in Orlando, dropping in on a fourth-grade classroom and shaking hands with students who said they were learning about the history of Florida. When one girl said she wanted to own her own business, he said with a smile that she's "gonna make a lot of money. But don't run for politics." The president, who was joined by Education Secretary Betsy DeVos, a longtime charter schools advocate, described St. Andrew as "one of the many parochial schools dedicated to educating some of our nation's most disadvantaged children." "Education is the civil rights issue of our time," said Trump, repeating a line from his address to Congress this week. Teachers unions were quick to criticize the visit, saying it showed hostility by Trump toward public schools and an intention to turn education into a profit-making industry. Trump said he would ask lawmakers to pass a bill that would fund school choice for disadvantaged young people, including minority children. He did not offer any details. Among his guests were Gov. Rick Scott, Sen. Marco Rubio and Denisha Merriweather, who used Florida's school voucher program to attend a private high school that she credits with turning her life around. Many of St. Andrew's students attend the school using the same voucher program as Merriweather, said White House spokesman Ninio Fetalvo. "We want millions more to have the same chance to achieve the great success that you're achieving," Trump said. The president also told Latrina Peters-Gipson, the school principal, that "the love you have for what you do is really fantastic." Despite being at the school, Trump also noted anew that he captured Florida in last year's election. After the visit, he flew to his coastal home in Palm Beach and later attended a Republican National Committee fundraiser that was closed to the news media. Trump was scheduled to return to the White House late Sunday. DeVos has a long history of promoting charter schools and vouchers. Charter schools are funded with taxpayer dollars, but are run by private groups and have more freedom over curriculum, staff and budget. Vouchers are essentially publicly funded scholarships given to low-income families to help cover private-school tuition. White House spokesman Sean Spicer said earlier in the week that education is "a top priority" for the president. "He has said many times before that education has the ability to level the playing field for the next generation," Spicer said, adding that Trump "is determined to provide choice for every parent and opportunities for every child, regardless of their zip code." St. Andrew Catholic School teaches 350 children from pre-K to eighth grade. The school defines its mission as "developing the students' spirituality and creativity in order to be disciples of Christ in the 21st century." A photo on the school's website shows a smiling boy in school uniform holding a sign that reads "My goals: College. Heaven." "It's a very powerful message," said Samuel Abrams, director of the National Center for the Study of Privatization in Education at Teachers College, Columbia University, referring to Trump's choice of school to visit. "Advocates of traditional public schools should be worried because this means a diversion of funds from public coffers and thus support for public education." Randi Weingarten, president of the American Federation of Teachers, said that by visiting a private Catholic school, Trump is continuing an "ideological crusade." Weingarten said that in many cases voucher programs have not improved children's academic outcomes. She added that voucher programs are often not transparent in how they spend public dollars and in what the kids are taught. "To borrow a word from President Trump — it's so 'sad' that the president and his secretary of education have demonstrated such an antipathy toward public schools," Weingarten said in a statement. "Trump is in Florida to push choice and a backdoor voucher proposal as a way to turn education into a commodity."